Lose That Girl: RATE IT! Peeps Takin' Over! Following in the successful candy-coated heels of the Hershey and M&M stores, comes the sugary joy that is PEEPS! Yes, Peeps....those somewhat sickly marshmallow blobs in the holiday shapes of chicks, rabbits & snowmen now have their very own store to call home. Setting up shop in National Harbor, Maryland just prior to Christmas, Peeps & Company sells all sorts of Peeps products -- clothes, toys, as well as the fluorescent-hued candy treats. 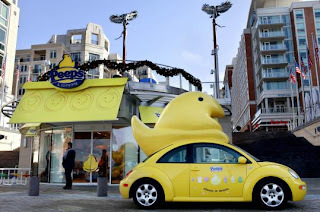 Best of all... the store features a yellow Peep-mobile with a freaky monstrous Easter chick Peep atop its roof. Oh, dear... there goes the neighbourhood!